Hummus is great in all it's avatars for me. I can have it as a meal if some of the chickpeas are left whole. I just want some texture to go with a hummus meal. Either some crisp slices of cucumber or some crackers make a hummus meal interesting but I can do even without them sometimes. The husband doesn't like hummus much in it's original form. So I devised a salad that reminds me of hummus and rids him of the pasty feeling that he dislikes about it. And this Green mung bean hummus serves the same purpose. I don't make it very smooth but keep the mung bean hummus a bit course in texture. Works really well for both of us. Minimal cooking, minimal blending and great taste. I even packed this chunky green mung Hummus in his lunch box one day. I have been posting his lunch box pictures on my page since there were many requests for healthy and balanced lunch box ideas. You can check out healthy options for adult lunch boxes here on my page. Boil the Mung beans with a cup of water in pressure cooker. Cook till the first whistle and then on lowered flame for 5 minutes. let it cool naturally till the pressure releases. All the water should be absorbed, drain if it has some. Make a mince of the green pitted olives. You can skip green olives if you wish. Mix all three and mash the mung beans a little if you wish. You can make a paste of mung as well if you want a smooth texture. Pour extra virgin olive oil on top and sprinkle some red chilly powder if you wish. I like a little lime juice sometimes, taste and adjust seasoning according to your taste and add lime juice if required. It should be a balance of flavors. 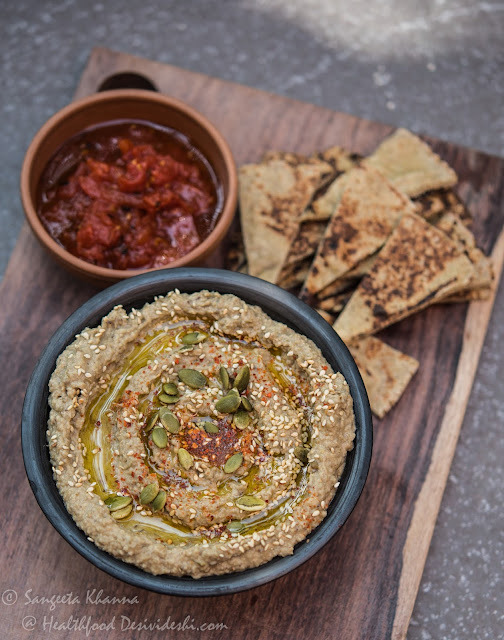 I love serving this green mung hummus with a tangy sweet tomato chutney and millet pita bread. *Recipe for the homemade Tahini paste... 1/2 a cup of white sesame seeds are dry roasted till aromatic and then ground in a mixie jar till pasty. Some Lime juice and about 10 garlic cloves are added, some salt to taste and then again blended till smooth. Some sesame oil can be added to get a preferred consistency. In this recipe I used Pumpkin seeds, Sunflower seeds and Sesame seeds in 1:1:2 ratio and the result was quite good. 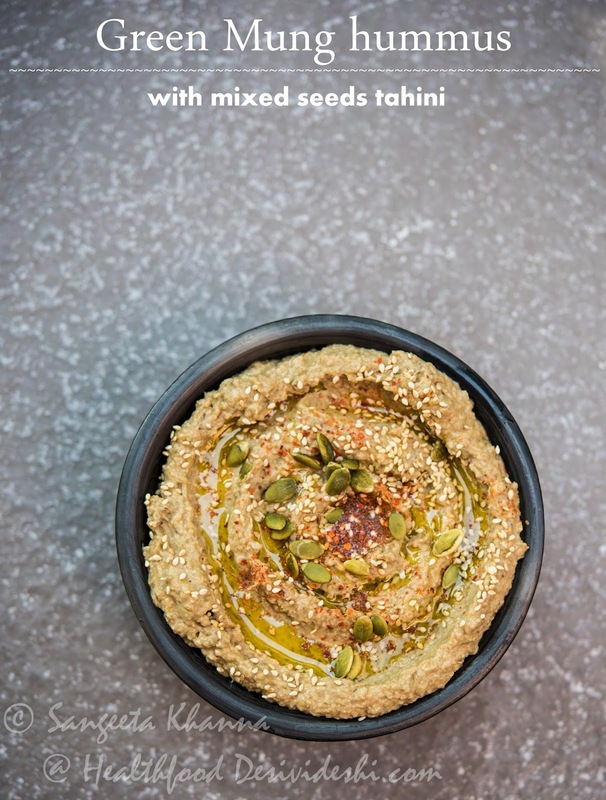 Green mung bean hummus is definitely a keeper recipe if you look at food the way I do. Food for healing, health and nourishment. Mung beans are wonderful for detox and cleansing, use them more. 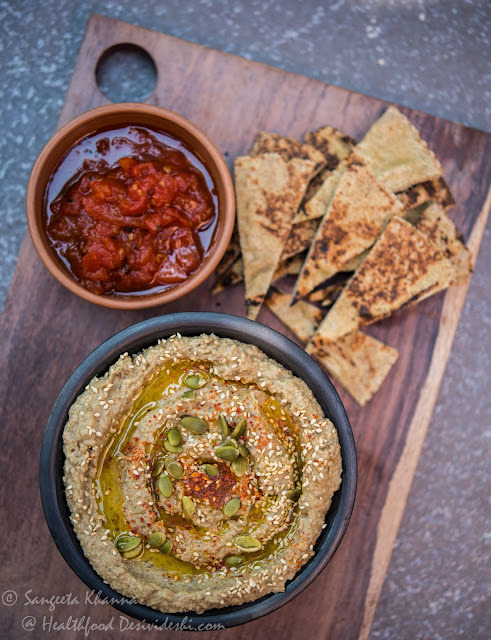 I am a big hummus fan-eat it all the time. This is definitely an interesting twist on a classic. oh yum! like olives in most things... i do put chunky bits of black olive in hummus sometimes.